Our Itinerary takes us to some of the most sacred sites in the world. Karma will bring our group together and all of us will journey the depths of our soul contracts and the unity will allow our destiny to unfold in the Motherland. Ceremony in the Ganga at Rishikesh. Invitation now to join me in 4-12November 2018. So, the lowdown...... 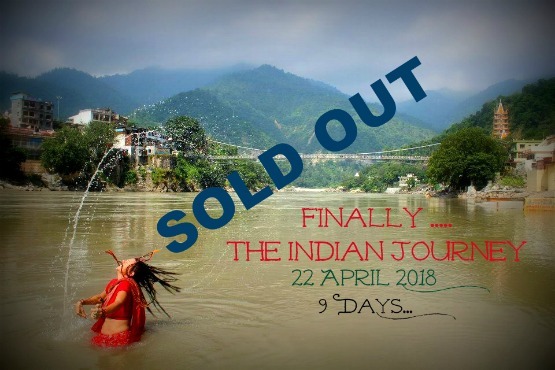 Since 2012 I have been asked to create an Indian Journey and I almost did, twice. Time is a funny thing, and right now the time is definitely ripe. I'm currently living in India and every single day so much arises and it's hard to explain what it's like being in this energy. It's extraordinary and raw and embracing and intense and every single thing in between. This journey has written itself. The sites we will visit have aligned themselves. The trajectory has shown itself. I am now to call in those to join. 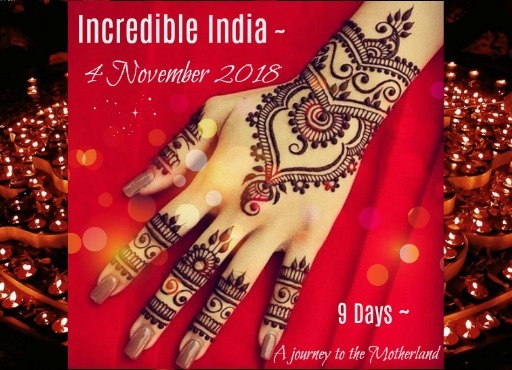 So I call you to sit and feel into this invitation of Inquiry to Incredible India. Starting in New Delhi and travelling north, we will fly inbetween our sacred sites as the distances are vast. We stay in very comfortable and beautiful air-conditioned hotels. We do ceremony, do group work, one on one work, travel together, eat together and walk through this karmic contract in unity. You will see and go to the places you have wished too, that's how these things work. If you are part of this group then your aligned destiny will be met. There will be sarees, bindis, flowers, offerings, prayers, purification, ceremony and a lot of local interaction. In usual style I am not going to give the itinerary as we always walk in faith and trust. I have most of the details down to a very fine point. Like I said there will be flights, this will please you no end. 4 flights in fact, which need to be booked as a group. So there needs to be decisions made. I will likely close off end of February to lock in the group and book everything together, unless we reach the group number first (likely). I'm keeping the group small because India is INTENSE and I love things to be intimate. I love the group being close and I love this karmic contracts and seeing them unfold. This will be quite the journey. I have already done a lot of ceremony around it. Seen a lot of visions and call in those now to connect with me. We will chat around your wish to join. Take a deposit to hold your spot. The cost of the journey to be paid by the time you arrive. I will assist you with flights, visas (super easy), transport to hotel and any plans after. During the journey, all the transport is booked and prepared (needs to be done in advance and with the individuals names). Hotels, offerings, entrance fees etc and some meals (food incredibly cheap here if have evenings off). You will be well prepared and supported in all logistics. Contact me today if you feel the call. Write me if you are feeling the call for November 2018! Meditating inside breathtaking Taj Mahal, Agra. You will need an Indian E-Visa... easy to apply online https://indianvisaonline.gov.in/evisa/tvoa.html... do so 5 days before departure. There are lots of ways to fly. A lot of stop-overs are via KL. Good prices on Malaysia Airlines. There are direct flights with Air India out of Sydney if you are coming from Australia. And you can get very cheap flights if you spend time and use a couple of airlines like Air Asia, Sri Lanka Airlines, Malindo, there's many budget asian airlines. There seems to be a lot of travellers in India who use this site too, https://www.kiwi.com/. You will need to arrive the day before, you will have the hotel name in Delhi well before you leave. I'm a master at flights and traveling so ask anything.